Few years after its appearance, what are the new 3D printing issues? 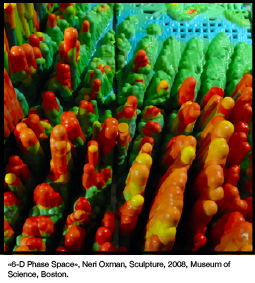 Over the past few years, 3D printing was a matter of many projective proposals. Starting from a printing service to a personal printer at home, all these projects become real. Indeed, many companies offer to send home an object from a file sent by the internet and conceived on the computer. Still on the internet, many websites explain how one can make one’s own 3D printer from a kit. What are the new issues of 3D printing? Some seem to think that we head for a new industrial revolution and others that the limits of this technology have been reached. Facing its increasing accessibility, in which case would it be relevant to use it? 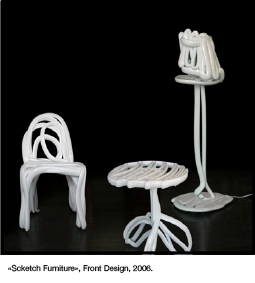 When in 2006, the Swedish group Front Design with the « Sketch Furniture » makes a creative process in which the drawing or furniture in space is filmed and transformed into a computer file, it is then embodied by rapid prototyping, predicting 3D printing future as a material translation of a sketched thought. 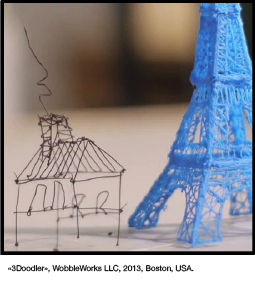 In February 2013, the prototyping becomes even more immediate with the printing pen « 3 Doodler ». 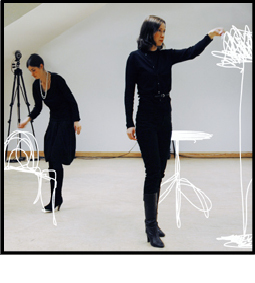 Here the technique allows to represent the instantenious thought and fluidity of drawing ; to invent new gestures and to transform a drawing simultaneously into a solid volume. 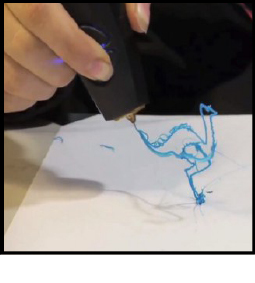 It is still a gadget stuck between a rapid modeling tool and a clumsy drawing (the result looks like one having used a glue gun). It needs to be perfected and become less « useless ». Howhever this object revolutionizes means of expression by the combination of drawing and sculpture, sketch and its volume, and stands for a possible step forward in this kind of new expression process. Speaking about revolution, tridimensional printing offers to get rid of some production constraints like making the production accessible to all, reducing products’ standardization, making the production become more local and therefore avoiding transportation or storage. This technique fits into the Do-It-Yourself movement. But does it really allow the user to break free from actual production processes in favor of a prolific amateurism? 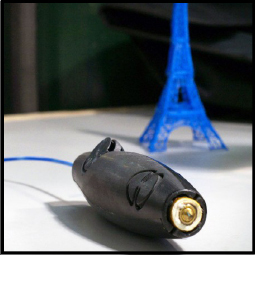 With an increasing democratization, 3D printing production costs seem to be reduced. Even if the individual printers only allow to print objects at a small scale and with a disappointing resolution, nano-factories are set up to produce detailed items. We must take into account that 3D printing is only a technique amongst all the technics used in Industry. Concerning customization, if the data is exchangeable and all the objects are easy to access and to print, won’t we end up with a formal standardization? Furthermore, the utopian dream of a limitless and accessible production seems to have a bitter taste and reminds us of the beginning of our consumption society from which we are still discovering the disastrous consequences. On this occasion let’s not hurry but temper our enthusiasm and keep observing. This technique brings out solutions and vast opportunities by its ability to print from different materials such as plastics, metal, ceramic, glass, wax, sand and even food. 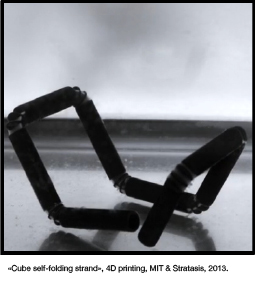 The MIT is now developing new 3D printed materials that react to water, temperature, light or vibrations. But it is the medical world that bears the most controversial project that could also lead to real social progress. In the movie « The Fifth Element » by Luc Besson, Leeloo, the main character is artificially created from cells of an alien hand. This scene seems unreal howhever we are not so far from its possiblity. 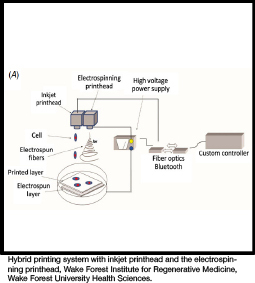 Recent experiences show that it is possible to print any living cell from stem cells. 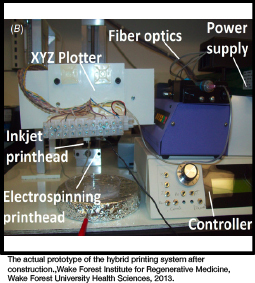 In 2012, the London Institute of Physics’ scientists invented a printer that can make artificial cartilage. Meanwhile a Scottish team worked on printing human cells from stem cells. This process is still on its very first stage but scientists already believe in the possibility of printing organs for a single patient and avoiding donations and rejections. What if we could print organs or blood? Like for 3D printing, would we remain with replicas of our body or would we experiment other shapes, colors or materials? Would we redesign the entire body? 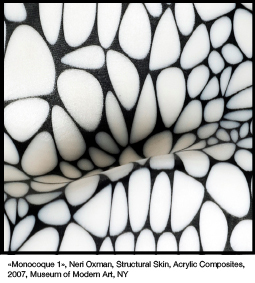 The architect and designer Nexi Oxman shows by her work the best 3D printing options. Indeed, she offers to print building parts with composite materials responding precisely to resistance and environmental restrictions. Her work is about new material research. Within her numerous projects, she made a chair that adapts to its user’s behavior and has some of his DNA inside it. 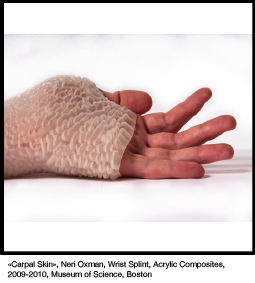 She also made a glove against the Carpal Tunnel Syndrome where the material responds to the pressure of the wrist and adapts itself to every patient. Tridimensional printing offers incredible individuation possibilities due to its individualized production. This technique’s future issues are singular and in a large panel of created printing materials. Thanks to the designers’ involvement it becomes possible to apply it for salutary applications. Film « The Fifth Element », Luc Besson, 1997.